A once buried and forgotten "Vintage Flour Mill" from the Poroutawhao area, has been salvaged and partly restored to its former glory. following is the story and photos off how this all came about. bypass thanks to the efforts of a local farmer. of Works in the 1980s. volunteers with private funding from the Stewart Family Trust, Society of Mary and Poroutawhao Hall Society. who cut the ribbon officially opening the replica mill. belonged to by the French Catholic priest and mill builder. mill at its Horowhenua Showgrounds clubrooms. club, officially opened the replica reconstructed mill and machinery. and one of a number built in Horowhenua, with machinery imported from France. race, drawing water from a blocked off swamp, with a causeway across the swamp for access. Poroutawhao Hall committee had all contributed to funding the restoration. on |the job of researching, restoring and reconstructing the "Vintage Flour Mill"
18. Brian Eastam 19. Don McIntyre 20. 21. John Rapely 22. Warren Vaughan. 23. 24. 25. 26. Rex Williams 27 28. Warren Birch 29. 30. 31. Neil Bowater 32. 33. Bernard Scott 34. 35. 36. Left Photo : Part of the management team who put the project together. JEAN-BAPTISTE COMTE, aged 27 (on arrival in New Zealand in Group III on 9 Dec Jun 1839). He was one of the group of five catholic priests from FRENCH MARISTS. 1839 via the Cape of Good Hope. The Martha left on 10 November to land them in the Bay of Islands on 9 December, 1839.
with the care of Maori. process wheat grown in the area. The government of the day was encouraging Moari tribes ithroughout New Zealand to build mills etc. imported from Fance and England. The French Catholic Priest who instigated the project to build the flour mill. Then taught them how to operate and service the mill to keep it operating. race feeding water from the lagoon to the Flour Mill. original stones on the side. In the late 1840s and during the 1850s Maori agriculture enjoyed a period of expansion and importance in the economy of the North Island which has not been equaled since. 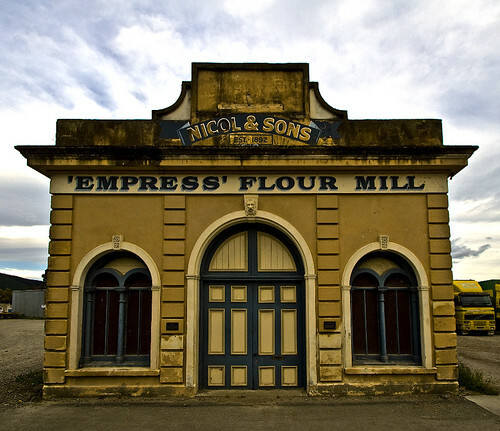 In an earlier paper the location and characteristics of the Maori owned flour mills of the Auckland Province during this period were discussed. Subsequent research has shown that the demand for water-mills was not confined to the Northern Province alone, but existed in fact throughout the North Islands. By the second half of the decade of the 1840s wheat growing had become a major agricultural activity in most areas of Maori settlement. Along the Wanganui River, for example, the land devoted by the natives to this crop was by early 1848 estimated to be at least 2,000 acres. At first steel hand mills were exclusively used for grinding the grain, but the Maoris found them tedious and with but a limited output. Repairs were also a problem. Besides, many districts were growing wheat in excess of that which the local tribe could consume, and some tribes recognized that if they wished to sell the flour to Europeans, only the better quality flour as produced by watermills would be saleable at an acceptable price. This was a further inducement for the Maoris to build water-powered mills and for a number of years surplus Maori ground flour was sold in the European towns. The earliest reference to the building of a flour mill by a Maori tribe south of Auckland Province appears to be in mid-1846 when the Maoris at Waikanae were said to be proposing to erect one as soon as they could obtain the necessary funds. However, a mill at Warea, some miles south of New Plymouth, appears to have been the first actually in operation, being at work by the closing months of 1847. The pioneer mill in Auckland had been erected at Aotea in the previous year. 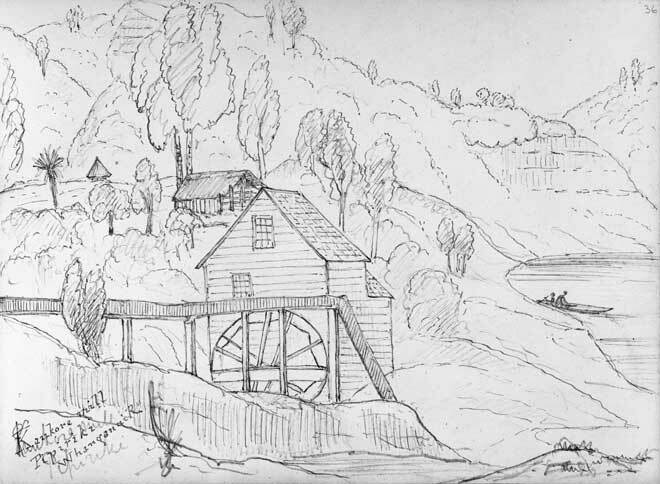 By mid-1848 four mills were reported as built or under construction in Wellington Province and three in Taranaki. Nine years later some nine mills were reported to be in operation in Wellington (including two in the Ahuriri district) with a further six in the Taranaki Province. Throughout the period some twenty mills in all appear to have existed in southern North Island. (Fig. 1). Page 2 From the map above it can be recognized that the greatest concentration was to be found in the coastal region from Horowhenua to Porirua where some seven mills were located. A noteworthy grouping within this region was centered on Otaki. Elsewhere concentrations of mills occurred in coastal Taranaki, along the Wanganui River, and in the Ahuriri district. 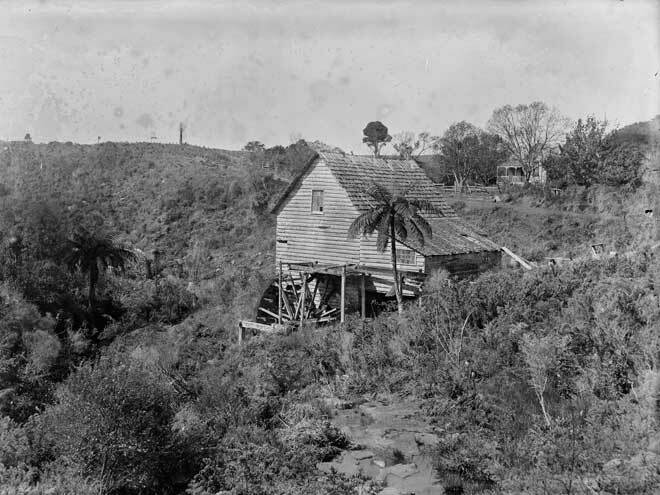 As in the Auckland Province, many of the mills were built as a result of encouragement by missionaries. Thus at Otaki the Church of England missionary, the Rev. Octavius Hadfield, encouraged the local Maoris in their agriculture and mill building. Unlike their practice elsewhere, the Roman Catholic priests in Wellington Province, particularly along the Wanganui River, took an active part in promoting the construction of flour mills. All missionaries, however, were not happy with this activity. One, for example, writing from South Taranaki, stated: "I regret that they do so little for the cause of God; but hundreds of pigs have been sent to New Plymouth to pay for their Mills, and they are still in arrears. "From the available contemporary evidence it seems that in comparison with the Auckland Province a greater proportion of the mills of the southern area were financed by the tribes themselves with apparently no help from the Government. For example the capital for the Otaki mill was raised by the formation of a company, the shares of which were taken up by individual members of the tribe concerned. As was true in the north the usual method of raising the necessary funds was by sale of pigs, wheat and other native grown produce to European traders or in settlement markets. In some places, such as Hawkes Bay, the money received from the sale of land was also probably devoted in part at least to this purpose. The only exception known where a mill was erected with financial assistance from the Government was at Papawai. In order to reduce construction costs, the Maoris provided the unskilled manual labour required, but a European millwright was always employed to install the machinery in the mill. Unfortunately there is little or no information available on many aspects of the flour mills of the region. Thus it can only be assumed that the number of pairs of stones per mill was usually one, as was the case in Auckland, although definite proof is lacking. No data was found on the size of the stones employed. As in the Auckland Province, the flour Mills in the southern part of the North Island were too often " kept partly as a showy plaything and as the contemporary observer put it," like the first watch a boy gets, they run a great chance of being damaged". Thus two mills in southern Taranaki were reported to be out of repair in early 1850, although they had been erected but two or so years earlier. The fear was expressed that, unless a European was employed to superintend operations, this would be the fate of all Maori water mills.